Some of you may have thought Bluff City Lights no longer exists but we are here! Summers are hard for us since we all travel so much but things are starting to settle down and we are getting the group back together again. 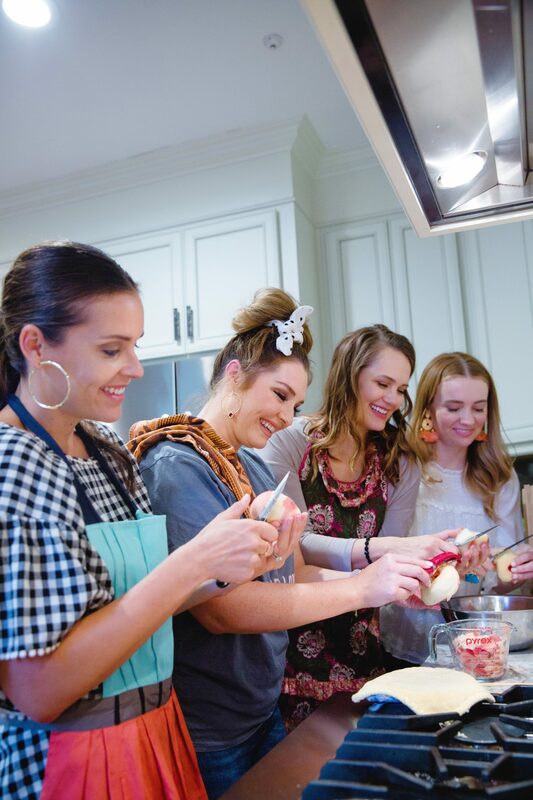 A couple weeks ago we got together at Collins’ Aunt Judy’s house to learn how to make her delicious peach pie. Let me start by saying I LOVE to bake. Cupcakes are usually my thing and I always bake from scratch. Seeing what’s in my kitchen usually inspires me to add an extra ingredient in here or there. My past favorites are Maraschino Cherry Cupcakes and Salted Caramel Mocha Cupcakes (comment below if you want me to post the recipe). Now that I’ve got two little boys to take care of I don’t have time to bake like I used to. If I do bake I try and make it a healthy option that I feel good about offering to my son like these Banana Zucchini Muffins or my Whole Wheat Pumpkin Oat Muffins. 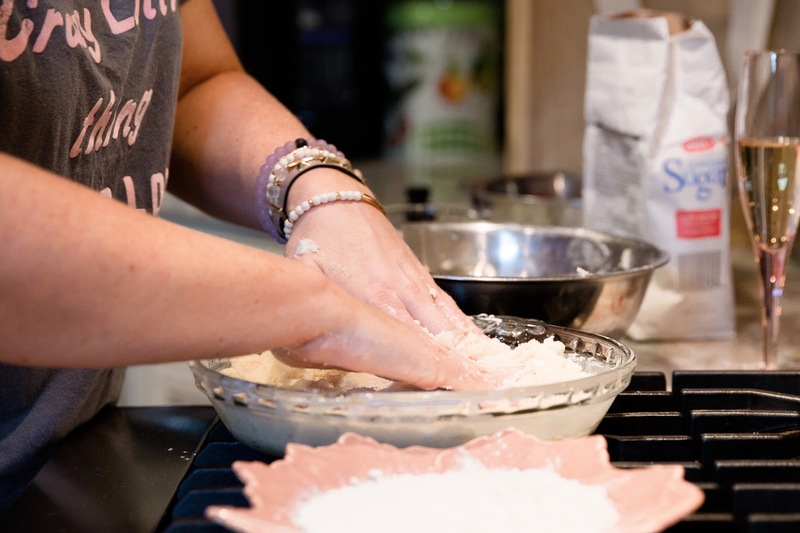 When BCL decided to get together to bake I jumped at the chance and took it very seriously! This may not be the healthiest recipe but it is one of the yummiest! Back to the peach pie! A little bit about it before you start baking. 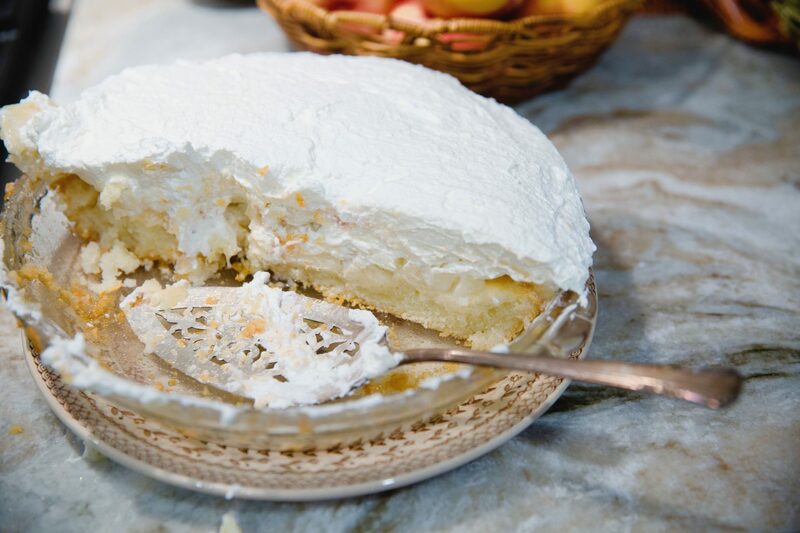 It isn’t your traditional pie, it is almost a cross between a cake and a pie. The crust is thick and doens’t need to be rolled out, there is not top crust, the more juice in the peaches the better and the whole pie is topped with whipped cream! Preheat the oven to 350°F. 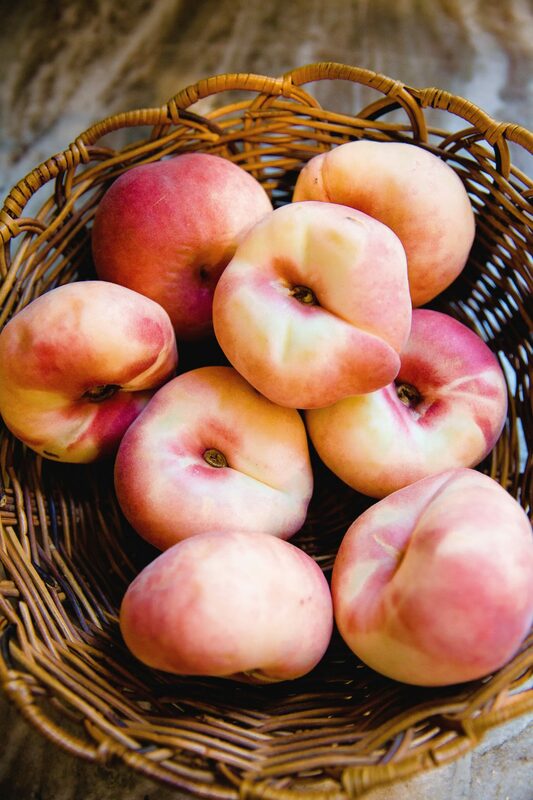 Start by peeling and slicing your peaches. You want 4-5 cups worth. Add 1 cup of sugar and put them in the refrigerator to chill while you make the crust. In a bowl add 1 stick of butter, 8 oz of cream cheese, 1/2 cup of sugar and 1 1/4 cup of self rising flour. 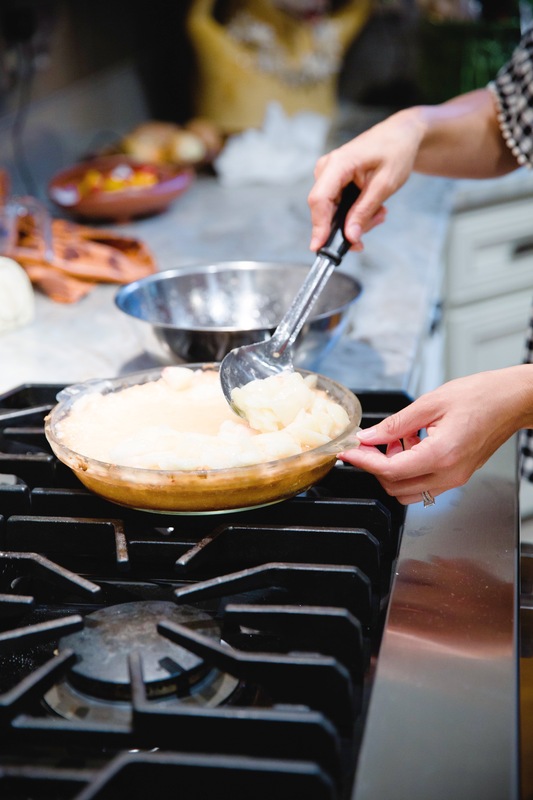 Mix all ingredients with your hands and kneed into a greased pie dish. You will have a think uneven layer of dough. Bake the pie crust for 28 minutes. Once it is done baking, let it chill for a few hours before adding the peaches. You may want to put it in the refrigerator to speed up the process (wait till the pie pan cools first). When you are ready to finish your pie put your beaters/whisk and bowl in the freezer. You want these to be as cold as possible when making your whipped cream. Pour 1 pint of heavy whipping cream into your chilled bowl. Beat on medium speed and slowly add 1/2 cup of sugar. As the beaters continue add 1 tsp of vanilla extract. Once peaks form the whipped cream is done. Wrap cellophane over the whipped cream and store in the fridge to chill (don’t store whipped cream in plastic). When everything is chilled it is time to put the pie together. Ladle the peaches onto the crust and include all the juices. You may need to poke holes with a fork into the crust to get the juices to settle in. Next, spread the whipped cream on top. Voilà! I hope you guys enjoy this pie as much as we did. 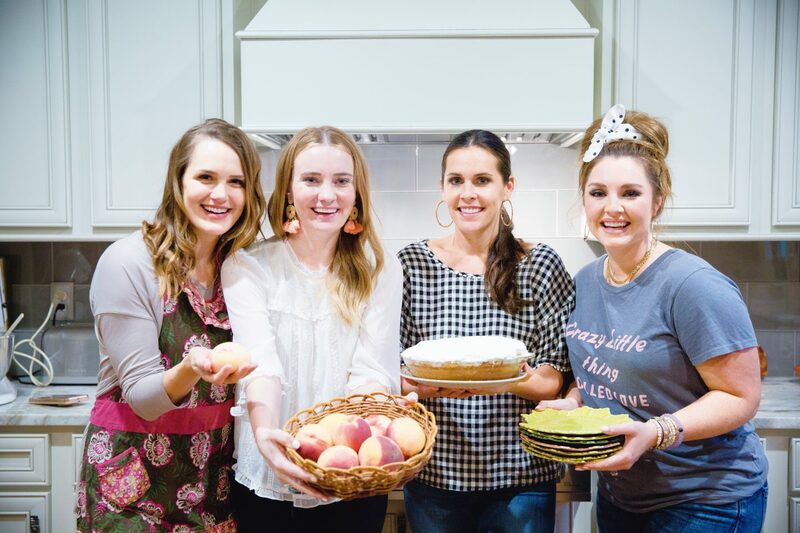 Half the fun of baking is doing it with friends.